keyestudio MAX6675 K-Thermocouple-to-Digital Converter module can independently perform functions of signal amplification, cold-junction compensation, linearization, A/D conversion and digital SPI Serial output. 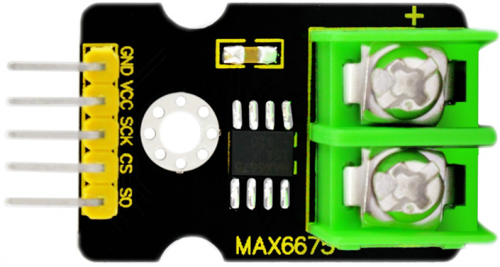 MAX6675 is integrated with cold-junction compensation circuit, with simple 3-bit SPI-Compatible Serial Interface, digitalizing the signal from a type-K thermocouple and output in a 12-bit resolution. This converter resolves temperatures to 0.25℃, allowing readings as high as +1023.75℃. Operating temperature range is among -20℃～80℃.